I don’t know much about fungi but feel drawn, especially at this time of year, to increase my knowledge about this fascinating kingdom of which the fruiting body is often the only visible part of a huge network spreading underground. Indeed the largest organism in the world is reported to be a honey fungus growing in the US. It reaches 3.8km across and is found in the Blue Mountains, Oregon. We used to think that fungi were exclusively parasites but increasingly it is realised that they can in fact have a symbiotic relationship with their hosts. For example fungi which colonise a plant’s roots actually aid the uptake of water and minerals from the soil by transporting these substances along its fine threads and bringing them closer to the plant. 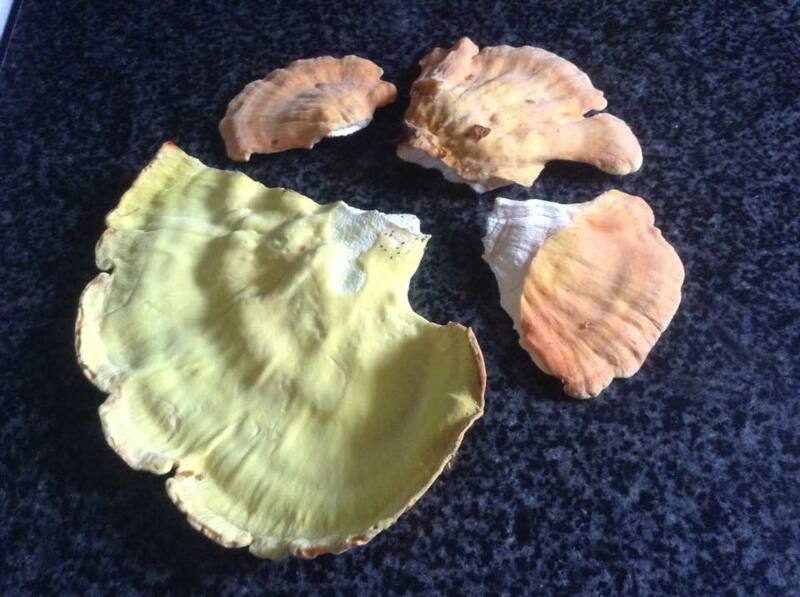 This particular fungus is called Chicken of the Woods (Laetiporus sulphureus) and this rather fine specimen was provided by my friend and local fungi expert Lynn. It was found growing on an oak tree, and like so many fungi, is perfectly edible. It has no gills, instead its bright yellow undersurface is covered with tiny pores. Anyway I can report it does indeed taste a bit like chicken and has quite a substantial, meaty texture. Indeed I served it up to my partner last night on the pretence that it was a chicken stir fry we were eating. He still hasn’t twigged! On a serious note, there are many edible and delicious fungi out there, but make sure you have identified them correctly before consuming. Also it is always a good idea to start off by trying just a little bit first in case of any reaction you may have. If you’re fine with it then it’s time to dig out some recipes and start experimenting!